The Maryland League of Conservation Voters (LCV) has released this video comparing the environmental records of Bob Ehrlich and Martin O'Malley. The Cleveland Plain Dealer and the Huffington Post are reporting that an Ohio McDonald's franchise owner enclosed the following flyer in employees' pay envelopes telling them that his ability to provide raises depends on them voting for "the right people." According to him, the "right people" are the GOP's candidates for Governor, Senate and the U.S. House. The McDonald's owner has since apologized for his "error in judgment." Republican District 17 House candidate Dan Campos has sent out the mailer below going after Democratic Delegate Luiz Simmons on domestic violence. Simmons is running on that issue, but Campos reminds voters of his introduction of the abuser expungement bill and his vote against a bill that would have made it easier for abuse victims to get protective orders. These sorts of votes are a big reason why Montgomery County NOW and NARAL Pro-Choice Maryland have endorsed Campos instead of Simmons despite Campos's running as a Republican. A coalition of elected officials, unions and other groups has launched a late challenge to the effort to repeal the ambulance fee (known as Question A). This flyer is one of the tools they are using to urge voters to preserve the fee in order to avoid budget cuts by voting for Question A next week. In antediluvian times (pre-1980), Democrats and Republicans, liberals and conservatives and moderates (yes, moderates were once prevalent in each political party) would work to govern together. It was called “bipartisanship.” It was how simple laws (like civil rights acts, Medicare, environmental statutes) got passed. It was how people were placed on the Supreme Court. It was how economic and fiscal policies were adopted. The easy stuff. The election of Ronald Reagan changed all that. The iron grip of party primaries, which, state by state, grew to dominance during the 1970’s, led inexorably to narrowly-focused interest groups taking control of each political party, imposing rigid purity tests, and driving out those deplorable moderates to political purgatory. The Republicans clearly have been more ruthless than the Democrats thus far, but, then, we’re just some thirty years into this. People do learn and adapt. Basically, the Democratic Party has become the Liberal Party. The Republican Party has become the Conservative Party. And the U.S., partisanly speaking, has become the U.K. minus those miraculously brief election campaigns. That bipartisan political contract we learned about in eighth grade civics class, which governed America for the century following the end of Reconstruction, has lain in tatters for a generation now. The underlying context of realistic entertainments like Allen Drury’s whip-smart novel Advise and Consent (1959) and Gore Vidal’s piercing play The Best Man (1960), faithfully filmed by Hollywood in 1962 and 1964 respectively, has long evaporated, to be replaced by the political “culture war.” And what has all this ideological turmoil actually gotten us? Merely confusion, cynicism, gridlock, anger, Fox Views, and Comedy Central (the one bright spot). So, to make some sense of it, to cut through that confusion, we need a scorecard, something akin to baseball’s box scores (God bless baseball, the one American constant everyone, from right-wing carnivores to left-wing vegans, can turn to for common comfort, if only for half the year). And heaven knows the mainstream majority, those pesky, hapless moderates, needs to better appreciate how it fits in while wandering about the political wilderness as souls without a party. Here, then, is their opportunity to distill, to clarify, and then, daringly, to choose a side. Or perhaps, just perhaps, they should remain right where they are — unloved, unwanted (except on election day), yet usually dead-on. Bob Ehrlich depicts himself as a tax cutter. Isn’t that good for Montgomery County? It depends on which taxes you’re talking about. Ehrlich has made criticism of Governor O’Malley’s 2007 special session tax package a centerpiece of his campaign. His primary tax proposal is to repeal the special session’s one-cent increase in the sales tax, which accounted for a majority of the tax package. Ehrlich characterizes the sales tax as regressive. It certainly is, but these are crocodile tears from the former Governor. He expressed his real feelings about the working class by closing the state office that enforced child labor, minimum wage and other labor standards in 2005. If Ehrlich does repeal the sales tax increase, who would benefit the most? The following chart illustrates per capita sales tax payments for every Maryland county (as well as Baltimore City). Ehrlich does not have much of a record of cutting taxes, but he does have a record of raising one tax in particular: the state property tax. In 2003, Ehrlich voted in favor of a property tax hike from 8.4 cents to 13.2 cents for every $100 in assessed value on the Board of Public Works. (The board cut the rate back to 11.2 cents in 2006.) That tax hike raised a net $692.9 million over four years. The state does not report its property tax revenues by county, but it does report each county’s assessable base, which drives property tax payments. Here is the estimated assessable base per capita for the tax year starting on 7/1/11. MoCo accounts for one-sixth of the state’s population and one-quarter of its assessable property base. Its assessable base per capita (an estimated $188,910 next year) is 47% higher than the state average ($128,151). This is the major tax hike that Ehrlich chose in his first year in office – a tax hike that disproportionately hit MoCo. So Ehrlich would cut the sales tax, which would primarily benefit other counties, but he raised the property tax, which primarily hit MoCo. How would Ehrlich pay for his sales tax cut? 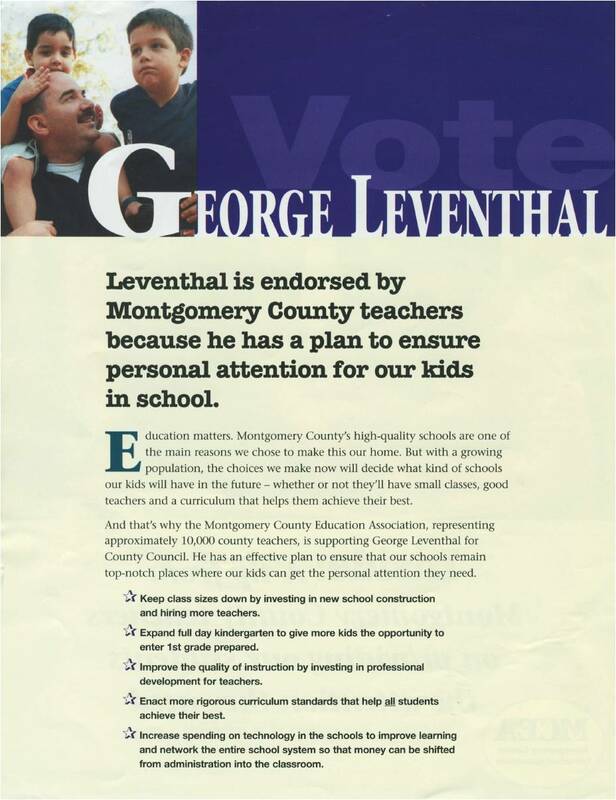 We learned the answer to that in Part Two: he would cut MoCo’s education funding and saddle MoCo with responsibility for teacher pension payments. This set of positions in addition to his throwing in the towel on the Purple Line and transportation funding is diametrically opposed to Montgomery County’s economic interests. That’s why Bob Ehrlich is the Anti-MoCo candidate. The District 14 Democratic Team - Senate nominee Karen Montgomery, Delegate Anne Kaiser and Delegate nominees Eric Luedtke and Craig Zucker - is distributing this lit piece for the general election. County Executive Ike Leggett used the Department of Economic Development's (DED) email system to send the following message yesterday about Question A, the ballot question on the ambulance fee. Montgomery County is facing an important issue that could have an adverse impact on our businesses, so I wanted to take a moment to give you the facts. County Question A concerns the County’s Emergency Medical Services Transport fee, which was passed by the County Council. 1) Approve the Fee so the County can recover ambulance transport costs from premiums already paid to insurance companies, Medicare, and Medicaid that amounts to $14 million this year and $170 million over the next 10 years. All revenues would be dedicated, by law, to strengthen our Fire & Rescue Service. 2) Without the Fee, cut an additional $14 million in critical services out of the County’s current year budget. According to the plan submitted on October 5 by County Executive Leggett to the County Council, the result could be $6 million in cuts to our County’s Fire & Rescue Service and a loss of 89 career firefighter paramedic positions. That will affect ambulance response times, making all of us less safe. 3) Without the Fee, raise taxes. County Executive Leggett has said that County residents already pay a Fire Tax and that there’s no reason to increase taxes when $14 million is there on the table in insurance reimbursements. Recovering EMS Transport Fees from insurance companies, Medicare, and Medicaid makes good business sense. Nearly every jurisdiction in the Washington region is already collecting millions of dollars in these reimbursements – with no adverse effects. They are using those resources to save lives – and Montgomery County should do the same. We cannot afford to leave this money on the table. Let me be clear. Contrary to what you might have heard, if County Question A is approved, no County resident will ever get a bill for ambulance transport, co-pays or deductibles -- whether they have insurance or not. And, there is no evidence that insurance premiums have risen because of implementation of a cost recovery program, because ambulance transport fees are already paid through most policies or coverage. The League of Women Voters of Montgomery County, which for many of us is the “gold standard” for the public interest, supports the County’s ambulance reimbursement program. So, too, do editorials in the Washington Post and the Gazette newspapers. County Question A is about protecting our families, our businesses, and our property – at no additional cost to County businesses or residents. Learn more at: www.montgomerycountymd.gov/emstransportfee. Dan Campos is running as a Republican for a District 17 House seat. What Do Marylanders Think of the Tea Party? One of the more interesting questions asked in the recent Baltimore Sun poll was the opinion of respondents on the Tea Party. Here are the favorable and unfavorable ratings given by the poll’s 798 likely voters. These are the ratings by demographic group. And these are the ratings organized by net approval. We caution readers to take the results from subcategories with less than a couple hundred respondents with a grain of salt. Small sample sizes often yield shaky estimates. But look at the differences in net approval between Ehrlich voters and Republicans and everyone else. To the extent that the Tea Party is exercising influence over and is becoming associated with these two groups, it is isolating them from the rest of the state. Fri-Sunday, October 29th-31st, at 6 p.m. In Part One, we showed how Bob Ehrlich’s positions on transportation and the Purple Line would damage Montgomery County. Today, we examine a different set of issues that are connected to another county priority: education. For decades, the state government has administered and financed a pension fund for teachers and other local school employees for the purpose of attracting talented educators. The system has contributed to Maryland’s repeated Number One ranking for its public schools. But the pension fund has encountered three problems: a change to the state’s contribution formula enacted during the Glendening administration that allowed the state to lowball its payments into the fund, investment performance problems during the recent stock market crash, and a large unfunded benefit increase signed by Governor Ehrlich. The state will either have to increase its contributions to the pension fund, restructure future benefits, or both. But some in Annapolis have a different idea: pass down the funding obligations to the counties even though they did nothing to cause the problems. 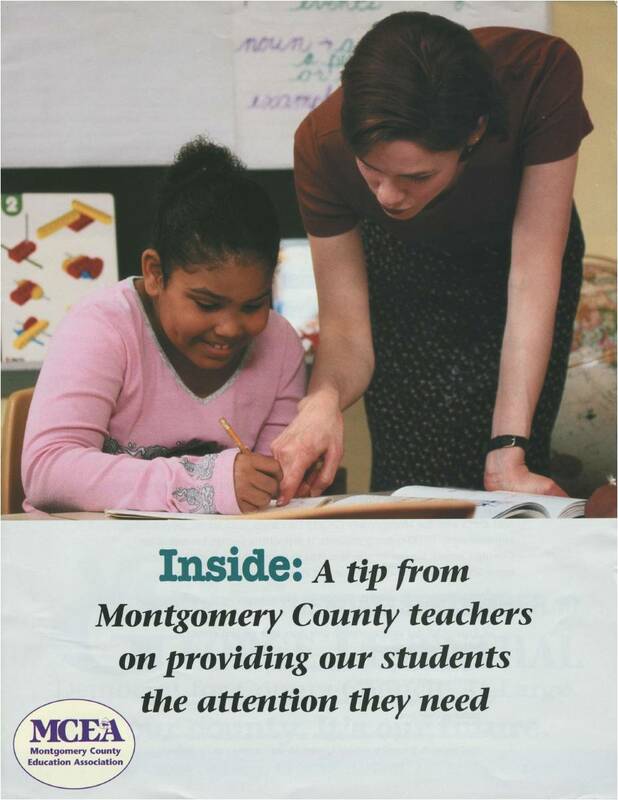 The state’s assumption of teacher pensions is one of the few state programs that benefit Montgomery County. That’s because MoCo hires lots of teachers and has to pay them well to compete with the rest of the Washington area. Most of the state’s other aid programs are tied to wealth formulas that send MoCo tax dollars away to other jurisdictions. In the last session, the Senate passed a handoff plan that would have cost MoCo $192 million over four years – far more than any other county. MoCo already runs nine-digit annual budget deficits and such an additional cost would play havoc with county services. So what of the two candidates for Governor? Ehrlich favors at least a partial shift while O’Malley is vague. We do not find O’Malley’s ambiguity comforting. But the truth is that O’Malley has had multiple opportunities to pass down pension liabilities to the counties, an idea aggressively supported by the Senate President, and he has not done so. Ehrlich’s election would certainly saddle MoCo with a gigantic pension obligation that it cannot afford, while O’Malley’s reelection would give the county a little bit of hope that we can negotiate something marginally better. On this issue, MoCo’s interest aligns with O’Malley. Maryland’s Number One public schools ranking depends not only on the state’s funding of teacher pensions, but also in part on the massive amounts of state aid that go to its local school systems. Much of that school aid has its roots in the 2002 Thornton Plan, which committed the state to hundreds of millions of new dollars in school spending. Education funding is popular in Maryland, but Thornton is not just an aid program: it is also effectively a transfer program because it is driven by wealth formulas. That means the state disproportionately funds “poor” jurisdictions with money taken from “wealthy” jurisdictions. Let’s put aside the fact that MoCo is not as rich as the state believes. Montgomery County has one-sixth of the state’s population, pays one-fifth of the state’s combined income and sales tax revenues and accounts for one-third of its business income. One would believe that the county would receive comparable benefits from the state in return. But in FY 2009, MoCo received $166 million of the state’s $2.8 billion in base education aid, or just 6% of the total. This is despite the fact that MCPS has a higher percentage of limited English students than any other jurisdiction in Maryland. 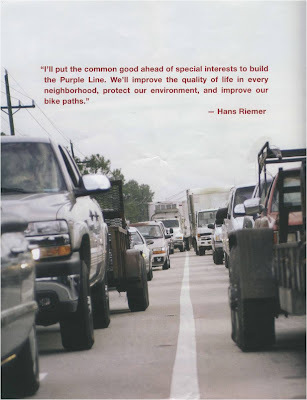 Back in 2002, when the Thornton Plan was being drafted, then-County Executive Doug Duncan and his top budget expert, future Senator Rich Madaleno, were aware that this kind of disparity would result. So they pressed the state to include a program with Thornton that would later be known as the Geographic Cost of Education Index (GCEI). The point of GCEI was to direct additional money to jurisdictions that experience higher costs of educating students. Because the program also benefited Baltimore City and Prince George’s County, it passed the legislature along with Thornton – but only as a discretionary spending item. Governor Ehrlich refused to fund it. Governor O’Malley phased in funding over his term. Let’s be clear, Governor Ehrlich. We in Montgomery County pay more in taxes to the state than any other jurisdiction. We are entitled to ask for a fair share of state money in return. We support any effort by our delegation to fund public education and to bring back the dollars we need for MCPS. Any politician who has a problem with that does not deserve our vote. Want more? Come back tomorrow for Part Three. This is one of two general election mailers House Majority Leader Kumar Barve (D-17) is sending out this week. Delegate Luiz Simmons (D-17) has sent out the following general election mailer touting his credentials in fighting domestic violence. We find his issue choice ironic given his introduction of a bill to allow accused abusers to expunge their court records, his vote against another bill that would have made it easier to obtain protective orders from abusers and his conduct in a hearing with a victim whose children were killed by an abuser. County Executive Ike Leggett sent out this message on the ambulance fee ballot question through the county government's email subscription service. I want to inform you of an important issue facing the County that could have an adverse impact on every County resident. Many of you are aware that the November ballot will contain County Question A. The Question gives voters the opportunity to decide whether County Council Bill 13-10: Emergency Medical Services (EMS) Transport Fee, which passed in May, should remain law. Under the law, the County would be allowed to recover ambulance transport costs from premiums already paid to insurance companies, Medicare, and Medicaid -- $14 million this year and $170 million over the next 10 years. All revenues would be dedicated, by law, to strengthen our Fire & Rescue Service. No County resident will ever get a bill for ambulance transport, co-pays or deductibles -- whether they have insurance or not. The Montgomery Fire & Rescue Service will continue to serve anybody in need, regardless of ability to pay – whether rich or poor or in-between, whether County resident or not. Just like now. Nothing will change – except that our Fire & Rescue Service will have more resources in meet critical future needs for staffing, equipment, and to improve EMS response times. Our neighbors are using those resources to save lives – and Montgomery County should do the same. We cannot afford to leave this money on the table. The League of Women Voters of Montgomery County agrees. So too does the Montgomery County Fire Fighters and Paramedics, Local 1664. Click here to see editorials in the Washington Post and in The Gazette newspapers supporting County ambulance reimbursement. I choose the first option. It just makes sense. As I travel around the County, I meet many residents who have asked for facts and accurate information on the EMS Transport Fee. For more information, you can go to www.montgomerycountymd.gov/emstransportfee. 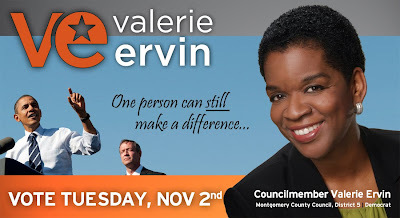 Whatever your perspective, please vote in the upcoming general elections as they are critical to our ability to maintain Montgomery County as the special place it is today to live, work, play, and age with dignity. In addition to voting in person on Tuesday, November 2 from 7 a.m. to 8 p.m. at your polling location, you may vote by absentee ballot. Absentee ballot request forms can be downloaded here and must be returned by October 26, 2010. This year, for the first time, you may cast your vote at any one of the Early Voting Centers in the County between Friday, October 22 and Thursday, October 28 from 10 a.m. until 8 p.m. (except Sunday, October 24). I urge you to consider joining the thousands of County voters who will be taking advantage of this highly efficient means of carrying out our civic duty. Senate President Mike “Big Daddy” Miller is pouring big, BIG money into a handful of Senate contests. And so are his lieutenants. Let’s look at his slate account. The Maryland Democratic Senatorial Campaign Committee has received $836,750 in contributions this year through 10/17/10. Here are the contributors. Miller himself gave the slate more than half its money. Rob Garagiola, who tied Finance Committee Chair Mac Middleton as the second-leading contributor, was just named the Senate’s next Majority Leader. Howard County Executive Ken Ulman must not be very worried about his Republican challenger, Trent Kittleman, considering that he maxed out to the slate. And the maximum contributions by the teachers and SEIU are interesting considering that one of Miller’s top priorities is passing down teacher pensions to the counties, a goal opposed by the two unions. Here is how the slate has been spending its money. The combined $160,448 in mailing and postage is a lot of mail. 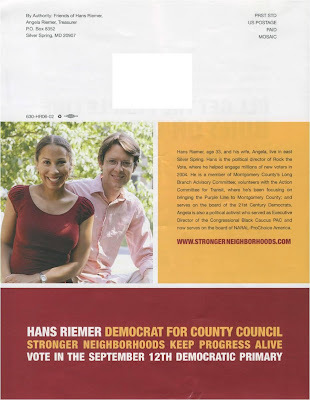 Consider that a countywide mailing to regularly voting Democrats in MoCo costs about $30,000-40,000. Then consider that MoCo has eight Senate districts. That means this money could have conceivably paid for at least a couple dozen Senate district mailings depending on which voters, and in which parties, are targeted. Then there is the nearly 300 grand for “media.” And finally, $73,900 of the “other” spending went for “research.” Our guess is that they are not researching the exact mathematical value of pi. The slate’s top target is Republican Senator Alex Mooney of Frederick County, an ultra-conservative who nearly lost to then-unknown Democrat Candy Greenway four years ago. Mooney’s opponent this time is former Frederick Mayor Ron Young. Mooney’s District 3, which includes Frederick City, has 34,626 Democrats and 31,042 Republicans eligible to vote in the general election. The slate has sent at least seven mailers into the district as of October 21, including two accusing Mooney of supporting “violent domestic abusers.” Because the slate reported $302,780 in cash on hand on 10/17 (and Miller himself reported having $341,372), Mooney will be seeing a lot more of those mailers. 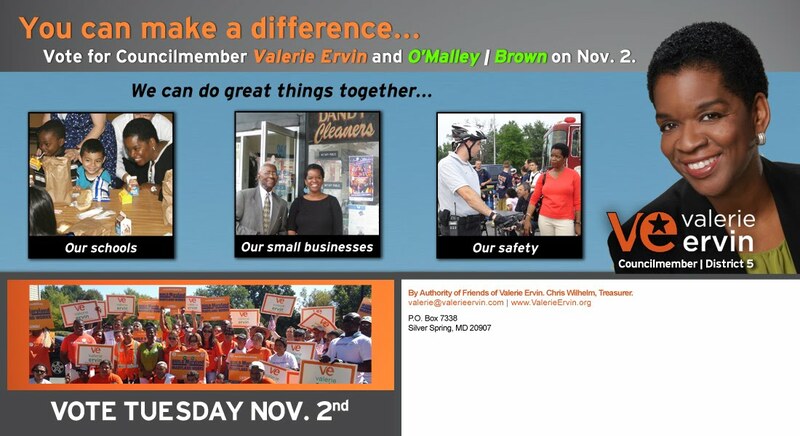 Mooney’s race is not the only one in which Miller will be participating. Senate Democrats would really like to pick up the open lower Eastern Shore seat being vacated by Republican J. Lowell Stoltzfus (R-38). The contenders are freshman Democratic Delegate Jim Mathias and Republican Michael James, who lost the Delegate race to Mathias in 2006. District 38 has 36,325 Democrats and 30,644 Republicans eligible to vote. The Democrats also have a number of incumbents to defend, especially in swing jurisdictions like Anne Arundel and Baltimore Counties. But that’s not a problem, since Big Daddy’s Big Money ensures that he can play in as many races as he wants. Wouldn’t it be something if the Senate Democrats actually increase their number this year? Update: Here are two examples of the slate at work in Anne Arundel County. Republican County Executive candidate Doug Rosenfeld is blasting the Post for saying in its endorsement editorial that Democratic County Executive Ike Leggett is running unopposed. The Post has corrected the error online and promised, "An editorial on that contest will appear in the coming days." But Rosenfeld told WTOP, "I don't see how you recall an action like this because people will take this endorsement guide with them to the polls." Additionally, the Post has reported on Rosenfeld's candidacy at least twice before. Any editorial writer reading the newspaper's own reporting would learn quickly of a Republican candidate for Executive. Following is Rosenfeld's press release. The editors of the Washington Post in today’s edition misrepresented that current Montgomery County Executive Ike Leggett is running for re-election unopposed. In fact, Leggett is opposed by attorney Douglas E. Rosenfeld of Potomac, who entered the race on May 24, 2010, four days before Leggett. The Post’s misrepresentation came in a column identifying its editors’ endorsements for political races throughout Montgomery County. Update: The Post has repaid Rosenfeld for complaining about this by endorsing Leggett in an editorial that is mostly devoted to bashing Rosenfeld. The article understates its point. Ehrlich’s positions are not just unattractive to county residents. In fact, when combined as a whole, they constitute the most blatantly anti-MoCo platform of any statewide candidate in recent memory. Consider the following items in Ehrlich’s platform. 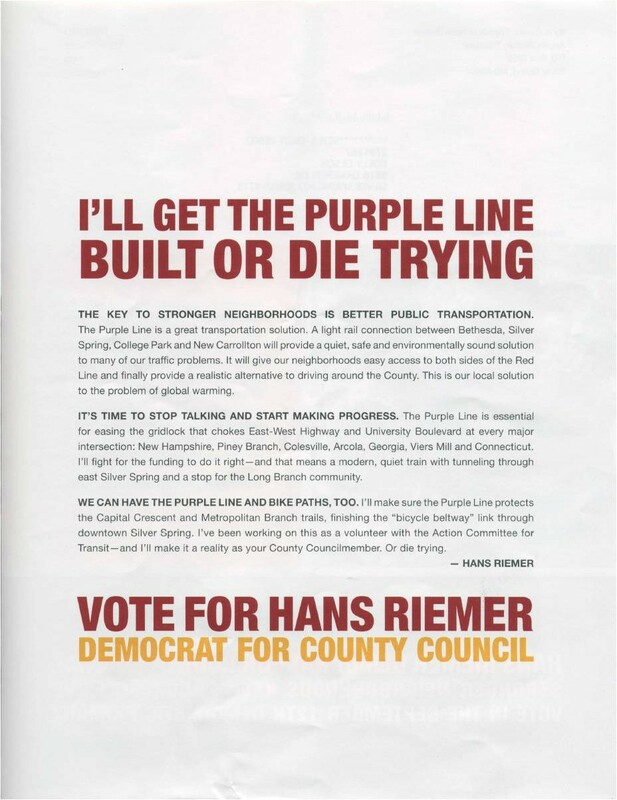 Ehrlich repeated his long-standing support for bus rapid transit instead of light rail for the Purple Line in May. That support is connected to his alliance with the Columbia Country Club, which opposes the Purple Line because it would cut through its golf course. 1. Most light rail options are faster than the bus options. 2. Light rail carries more people per day. So why does Ehrlich say he opposes rail? He told the Post, “You have to be honest with people, and the honesty is the dollars aren’t there.” Why is it that the dollars were there for the ICC, which was started on Ehrlich’s watch, but they are not there for the Purple Line? To his credit, Governor Martin O’Malley pushed the General Assembly to index the gas tax in 2007. They chose to raise the titling tax and devote part of the sales tax increase to transportation instead, which yielded little new funding for transportation. O’Malley continues to favor indexing the gas tax, an approach that will raise more money when gas prices inevitably go up. Ehrlich has no ideas for new revenue and his sales tax cut would cost the Transportation Trust Fund $48 million per year, a number he calls “manageable.” By cutting transportation money and then saying we cannot afford worthy transportation projects, Ehrlich is creating a self-fulfilling prophecy that will doom MoCo to endless congestion. We have expressed considerable frustration with the Lords of Annapolis for not adequately funding transportation in the past. But there is a big difference between O’Malley and Ehrlich on this issue. O’Malley has tried to increase transportation funding and has set high goals for both the Red Line and the Purple Line. He also has a record of protecting transit funding of all kinds. Ehrlich has thrown up his hands and openly tells us we deserve less. Such a position demonstrates that he does not understand our transportation problems and, in fact, does not care. On this issue, Ehrlich is the anti-MoCo candidate. But there is more. We continue tomorrow. Senate President Mike “Big Daddy” Miller sends District 19 Senator Mike Lenett, whom he had endorsed over challenger Roger Manno, a check for $2,500. Lenett needed the money for his Gang-Bangers for Manno mailer, his Holocaust mailer and his nuke website. Manno defeats Lenett by eight points. Miller sends Manno a check for $4,000. Well, that was quick. Congratulations Rog! District 3 Board of Education candidate Karen Smith is blasting At-Large Board of Education candidate Lisa Lloyd for distributing a flyer that misrepresents her positions. And because the flyer lacks an authority line, it’s illegal to boot! Here’s the flyer from Lloyd, which lists six campaign positions and urges voters to support her and three other candidates, one of whom is Smith. Note the lack of authority line on the flyer, which is required by state election law. 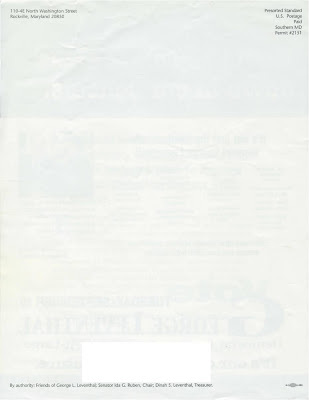 Upon seeing the flyer, Smith fired off this email to Lloyd and the other school board candidates. It was brought to my attention tonight that you are distributing a flyer with my name on it that purports to represent me as having signed on to your platform in your race for the Board of Education. I am writing to tell you to immediately stop distribution of this flyer as it seriously misrepresents my positions in this campaign. You did not consult me about this flyer, and if you had, I would have told you unequivocally and in no uncertain terms that you were NOT to put my name on it. 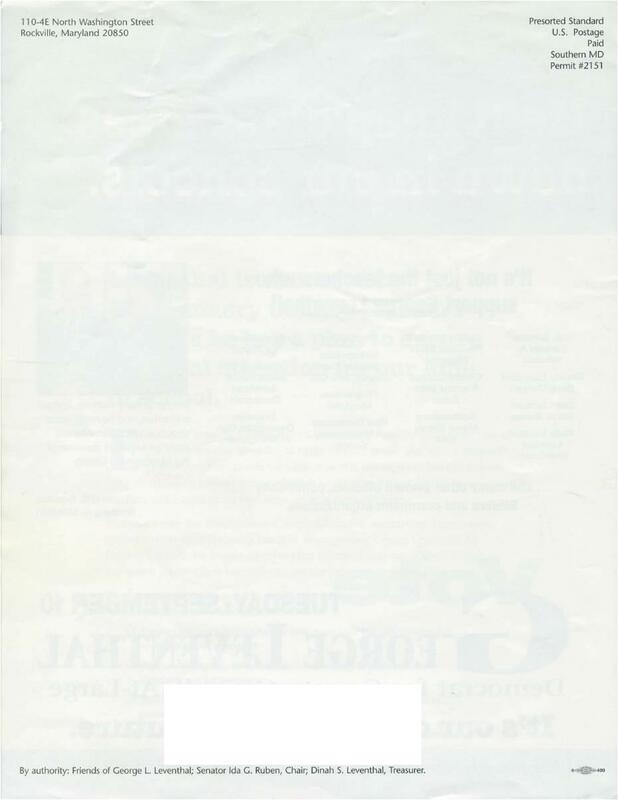 You will also attempt to retrieve any flyers that have already been distributed, or are in line to be distributed by other organizations on your behalf. Please do me the courtesy of acknowledging your receipt of this message and informing me of your plan of action to correct this. No word yet on whether Lloyd has corrected the flyer, or has chosen to obey the law. The dispute may not matter very much. Incumbents Pat O’Neil and Shirley Brandman, who are running against Smith and Lloyd respectively, have been endorsed by the Washington Post and MCEA. But what this squabble lacks in profundity, it certainly makes up for in sheer entertainment value! On Saturday, the Sun reported that Martin O’Malley had spent significantly more money than Bob Ehrlich on television ads. A close look at the campaign finance reports illustrates just how big O’Malley’s edge is. On the reports, TV buys are lumped into the “media” category, which can include radio, print and billboards. But you can tell the TV expenditures because of their sheer size and the identity of the vendors. Ehrlich’s TV vendor is SSG Media Inc. (Stevens and Shriefer Group) of Washington, DC, a partnership of two former admen for George W. Bush. The ads are shot by Red October Productions of Washington DC, another Bush-connected ad firm that outsources projects from SSG. O’Malley’s TV vendor is Media Strategies & Research of Fairfax, a firm headed by a former Hillary Clinton staffer that has done work for the DCCC and MoveOn.org. Ehrlich pays his vendor directly while O’Malley sometimes pays his vendor through his slate account with Anthony Brown. In addition to undertaking production and consulting work, the vendors pass on payments to television companies. Six- and seven-digit payments from campaigns to vendors are usually mostly pass-throughs that will soon be sent to TV firms and used for commercials. Here’s a history of Ehrlich’s media payments to SSG and O’Malley’s media payments to Media Strategies & Research this year. This shows the lead O’Malley has built up over Ehrlich on TV. O’Malley began his TV work in May. Ehrlich did not make his first vendor payment until September 1. Through the end of September, O’Malley had outspent Ehrlich on TV vendors by $5.4 million to $782,078 – a 6.9 to 1 ratio. It was only on October 1 that Ehrlich became a serious player on TV. But by that time, the polls had moved from a virtual tie in the summer to O’Malley leads of varying sizes. All of this lends credibility to Blair Lee’s bitter thesis that O’Malley’s negative ads have damaged Ehrlich. If that turns out to be the case, then it reflects two tactical mistakes by Ehrlich. First, his relatively late entry into the race left him playing catch-up against O’Malley’s massive early campaign warchest. And second, his decision to let O’Malley rule the airwaves for months allowed O’Malley to drive up his negatives. Ehrlich is on the offensive now, but it may be too late for him to recover. Council Member Duchy Trachtenberg has reported $145,965.97 in cash on hand in her campaign account as of 10/17/10. No other council-at-large candidate reported having more than $8,000. This means that Trachtenberg left about half of her January warchest unspent during the campaign. Trachtenberg lost the fourth at-large spot in the primary to George Leventhal by just 3,981 votes. Since countywide mailings to regularly voting Democrats cost about $30,000-40,000 depending on how the targeting is set, Trachtenberg could have afforded another 3-4 mass mailings. 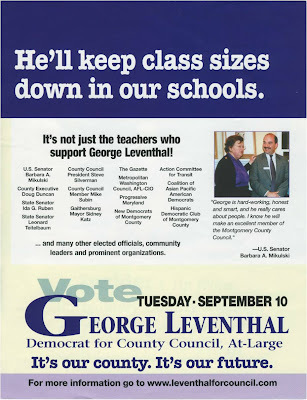 Could they have saved her and sent Leventhal home? It is time to take the threat of HIV seriously. A compassionate and serious solution must preserve the dignity of those infected while truly helping to prevent the spread of the disease in an effective way. One such solution is a tattoo for those who are infected. This mark could be inconspicuously placed, perhaps in a spot covered by a bathing suit, warning only those who might engage in intimate encounters with the infected person. An effective way to enforce the consistency of the tattoo would be to provide medicine to the infected individual only after they have received the HIV tattoo. 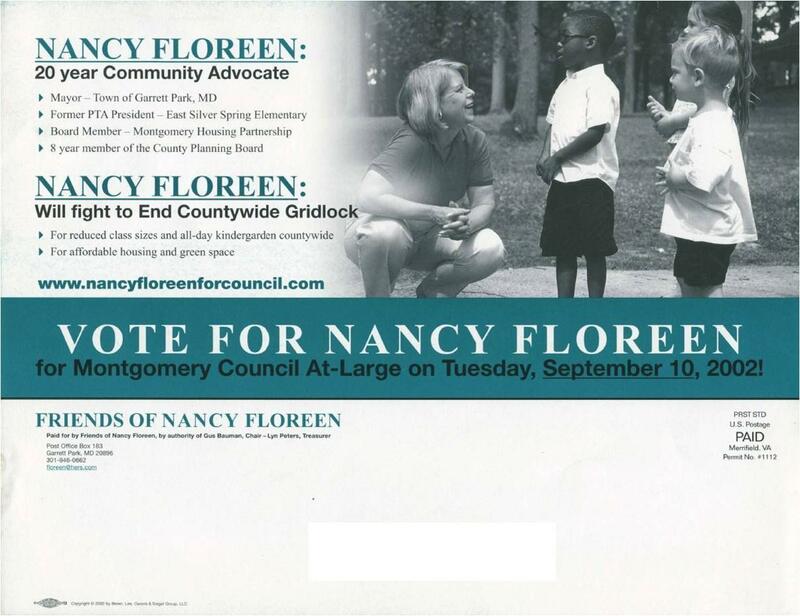 GOP Lieutenant Governor candidate Mary Kane has run for office twice before in Montgomery County. On both occasions, she used campaign funds to pay her family-owned firm, The Kane Company. The Kane Company is a furniture moving and installation firm headed by John M. Kane, who is Mary Kane’s husband and a former Chairman of the Maryland Republican Party. Mary Kane is a former director of the company. She denies owning company stock, but acknowledges that she would take full ownership of the company if John passes away and would be entitled to half of the company if the couple divorces. The firm is currently being sued by the federal government for wage and hour violations. Mary Kane was a candidate for the Montgomery County Council’s District 1 seat in a 2000 special election. She lost in the Republican primary to former Senator Howie Denis, who won the general election. She also ran for a District 15 House seat in 2002, losing in the general election to Democrats Brian Feldman and Kathleen Dumais. On both occasions, she used campaign funds to pay The Kane Company. Here is a complete list of payments from Mary Kane’s campaign account to the firm. All of these payments occurred during the time that Kane was a member of the company’s Board of Directors (1997-2003). The Kane Company is not a political consulting firm – it’s an office mover. So why was it being paid for “salaries,” materials and field expenses? Did any of these payments of campaign money generate a profit for the company? If so, does that violate the state’s prohibition on campaign funds being spent for personal use? Friday, Oct. 22nd through Sunday, Oct. 24th at 6 p.m. and Tuesday October 26th, at 9:30 p.m. Topics that will be discussed include the mid-term elections (and whether the Democrats can hold onto the House of Rep's), jobs, campaign financing, the Health Care bill, the Stimulus bill and other local issues. 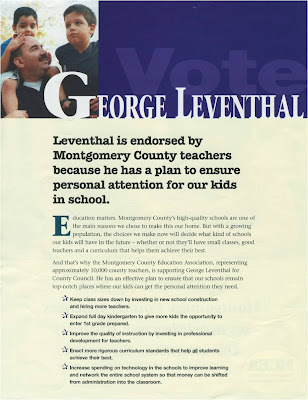 George Leventhal won his first at-large council race in 2002 the same way he won his next two elections: with lots of endorsements, especially from MCEA. 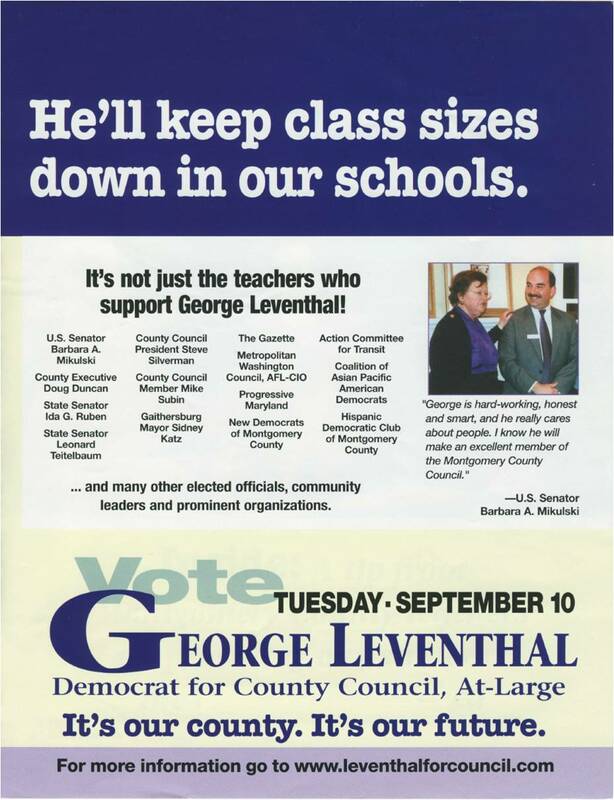 He devoted an entire mailer to education that year which we reprint below, but he couldn't help throwing in a quote from his former boss, U.S. Senator Barbara Mikulski. 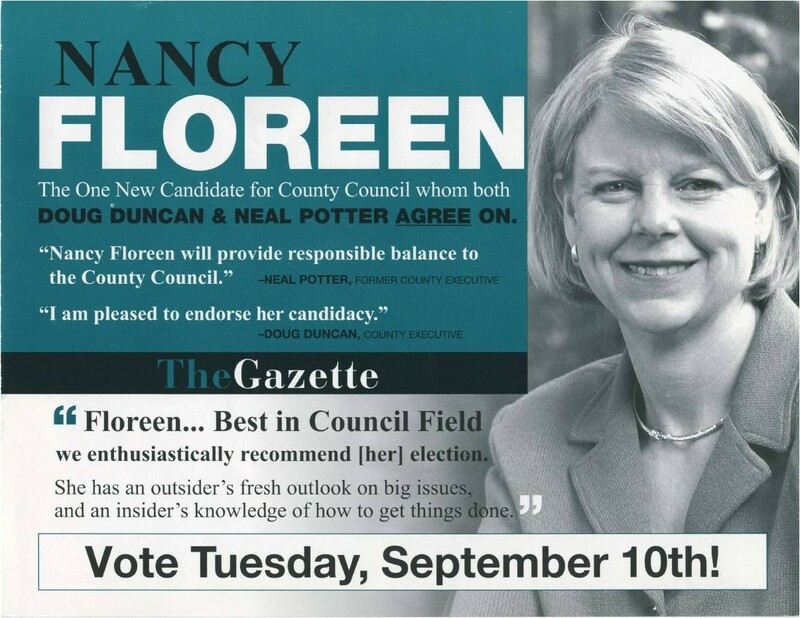 Nancy Floreen won her first at-large primary in 2002, in which she finished third. 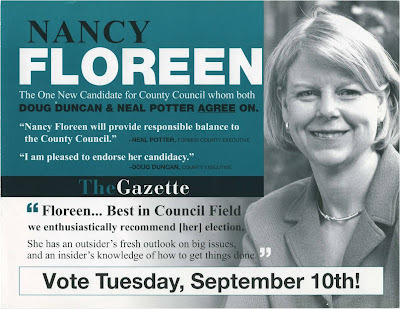 Here's a mailer from that year in which she touts endorsements from County Executive Doug Duncan and former County Executive Neal Potter, who at the time represented competing ideologies in county politics. Floreen has won three straight at-large primaries without the Apple Ballot, the only MoCo candidate we know of who has performed that feat. 8. Do You Believe Your Own Eyes? There you have it, folks. For MPW readers, the top three stories of the primary were the extraordinarily negative Senate races in Districts 19 and 39 and the defeat of Council Member Duchy Trachtenberg. We already know the top story of the general election: who wins the Governor’s contest. We just don’t know how that will turn out – yet. 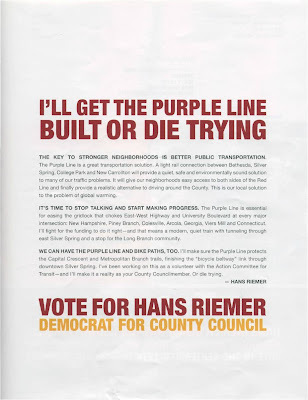 Martha Schaerr: "Stealth School Board Candidate"
Hans Riemer, 2006: "I'll Get the Purple Line Built or Die Trying"
Hans Riemer has always been an ardently pro-transit candidate, even at the risk of his own health. 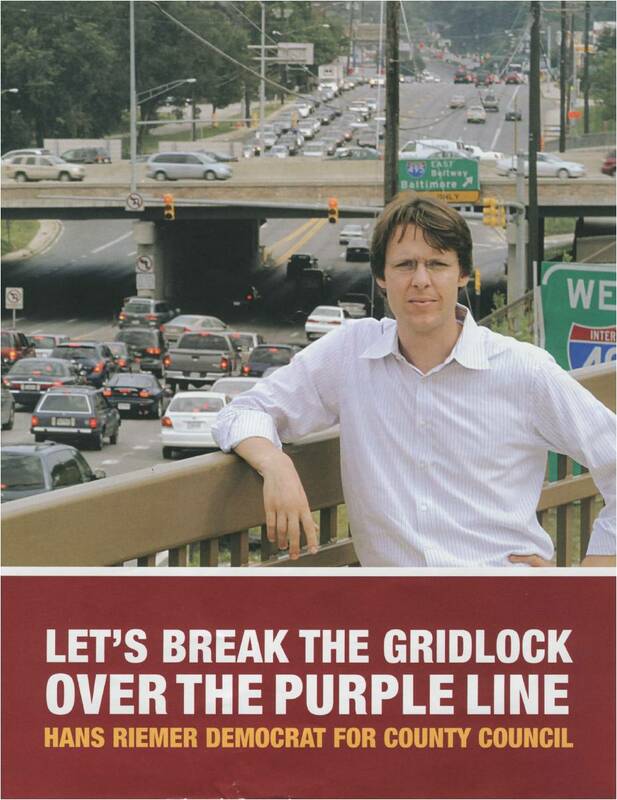 In 2006, he ran for the open Council District 5 seat and sent out this mailer in which he vowed, "I'll Get the Purple Line Built or Die Trying." Hans lost the election, but he did survive the mailer. He is headed to Rockville after finishing second in this year's council at-large primary. Is O'Malley Starting to Pull Away from Ehrlich? Sierra Club: "A Clear Choice for Governor"